Interests:Anything to do with the Ocean, Sailing, Boating, Tall Ships, Pirates, Martial Arts, Science Fiction and Fantasy, etc. etc. I know rapiers were a bit long for using on a ship, I gather they'd easily get tangled in the lines and rigging. But... I happen to love my rapier and how it moves in my hand. Is a rapier an unreasonable weapon for a pirate to carry? well, lets start at the beginning. is this a general question or are you planning on dressing out and wearing it. In general, it could be used but not high on the practical aboard ship front. Too thin to be used against cutlass' and long enough to get fowled in the rigging. Personal use... are you going period correct (PC) or doing your own thing (hollywood, renfaire, good immagination etc..) PC- Nope. Your own thing- yup. A word of caution though, they are long and get in the way in a crowd, especially a drunk crowd. The tip, amazingly enough, sits at kids eye level no matter how tall or old the kid. Situational awareness mate. Oh, a lot of events will not allow you to carry edges without a sheath- plan ahead. I have heard of sailers using rapiers with shortend blades. I have also seen rapier hilts remounted with saber blades. Often you find re-mounted rapiers with all sorts of blades. I would say that is it historicaly feezable, but many would disagree with me. I've been looking fer someone to put a shortened cutless blade on my favorite bronze rapier hilt (Custom from Lundgarrd Armory) but have not found anyone I trust enough yet since my wonderful Lars is not producing at the moment. I've had passing thoughts of having my rapier shortened to more of small sword size but... it's such a beautiful thing now that I'm loathe to do anything to it. It's the "classical" rapier from Windlass which I believe is no longer produced or sold. At least Museum Replicas doesn't carry it anymore. Unreasonable? I could go several directions with this question, but I'll just say this. If you prefer a thin, long blade as a weapon of choice, I would recommend the period smallsword. 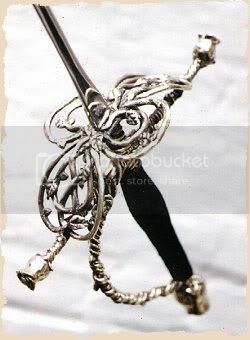 If the cost of additional weaponry is outside of your budget at present, wear the rapier with pride. We sometimes delve into the semantics of kit to the point of strong, contrasting opinions of right and wrong. There were thousands of pirates. One of them may have carried a rapier. Certainly it never would have been common. Certainly a shorter blade is more practical for obvious reasons, but as you already own one, don't fret over the matter too much. Better to consider additional arms such as a good musket then to worry too much about the blade you already own. Of course if you're playing a Captain of even modest means, you could have several weapons of choice. You might even have a few modified weapons as 1stMate Matt suggests. Hey I have worked with Lars plenty in the past and I know his work well. I would be happy to remount your sword with a cutlass blade. I could even work with Lars on it if needed. The grip was always a little long fer me but it's the curse of the magnificent hilt cage! Any idea on how they are mounted? Can you take them apart or are they welded to the blade? Sweet! I can do anything you want with them then. You pick. They both should be doable. Even if I have to make a special cutlass blade to fit. 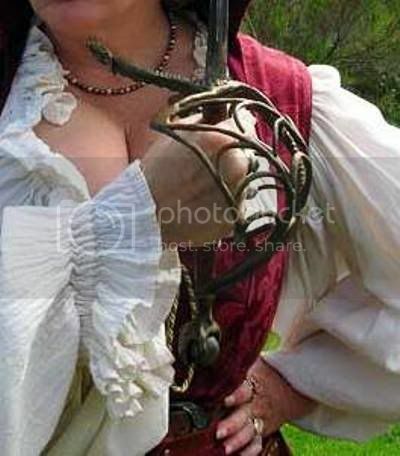 BTW I blieve in most cases Capt Hook is said to carry and Cup Hilt rapier... Just a thought. Well... I DO Love me Sea Dragon hilt... The pommel is a claw holding a labradorite. And you can post pictures of yer progress here. Send me yer mailing address in a PM? thanks for all the imput. I think I'll stick with my rapier for now, until I have a few extra copper to spend on a new blade. I think I like the weapons in the background behind the rapier. Those could disarm me anytime! I think I like the weapons in the background behind the rapier. Now, you mates are WAY too easily entertained! ROTDLMAO!!! You have no idea what even the mere suggestion of a female bossom does to a male psyche. And that, right there, is quite a bit more than a mere suggestion. You have no idea what even the mere suggestion of a female bossom does to a male psyche. Oh lad... Luck had NOTHING whatsoever to do with it! Lars is a true master and the hilt was measured and crafted to me hand like a glove. 'Twas adorned and polished and weighted for my arm and grip and it cost a Fair coin in the bargan. If someone had GIFTED it to me... then I would say you Aye, Lucky indeed! However... in point of fact that it was not I will say I earned every bit of it! I think the question is not so much could they as would they. I've seen any number of mismatched blades and hilts in museums all over Europe and the US. They were generally built to a purpose and were one offs. The question that I would have is would a deckhand pirate have the skill to use a thin blade with virtually no edge beyond the first few inches? The rapier is a thrusting weapon and does not have the mass to parry a cutlass in a dead stop. It relies on deflection to keep the opponent's blade away. The skills used in rapier fighting come at a cost of both time and money, neither of which is something that your average deckhand or topman is going to spend for such a purpose. Much the same can be said for the smallsword. While captains might have the skill, and one or two officers, the rank and file generally did not come from the class of people accustomed to the rapier and smallsword. The most useful cutdowns and remounts that I have seen generally fall into the 15-18 inch range, long dirks and fighting knives. At that length, the blade still has enough stiffness to be able to parry with bending, and the mass of the arm wielding it is close enough to the point of impact to still be useful. Just my two guineas based on a quarter century of rapier fighting.